After she died we weren’t really sure what to do with it so we hung beside his- like we had always done. Sometimes it is just best to keep doing what you know while you figure out what you don’t. So winter after winter we would hang his beside hers and there it would stay until the first sign of warmer weather appeared. His inaugural ride of the season would find him carefully maneuvering, holding tight to wobbling handlebars until he regained his balance. And just like that- he would be off, his bike his chariot we would find parked in the drive or laying on it’s side by the front door. He relishes in the freedom his bike brings, just as she had years before…. They would maneuver between chalk lines that had become a roadway through which they would race. Purple and pink vinyl streamers fluttered on one side of her handlebars and a basket held a small stuffed friend. Her helmet somehow ended up tilted to one side and despite every plea to not ride bikes in flip-flops, she’d be riding full throttle: In.Her.Flip-flops. The wind, the speed, the freedom were hers for the taking. Her bike would lean from side to side- two small training wheels provided all she needed to stay upright, within the lines and at pace that matched the brave one’s. And then it happened, she decided it was time to let go, lean in and take flight. It was time to take off the training wheels. That morning, the brave one set sail on his daily adventure not knowing that when he returned she would amaze him with her newfound skill. She and I started at the top and would sprint to the bottom. She’d plead with me, “Don’t let go.” Up and down, up and down, up and down the driveway we would go and when she least expected, I would release my grasp ever so slightly and the bike would wobble and I’d grab back hold. With each release and wobble she slowly found her balance. Each wobble and steadying of balance would fuel her fire of determination. She would dig in, tears of frustration running freely, not knowing whether to tell me to let go or hold on. 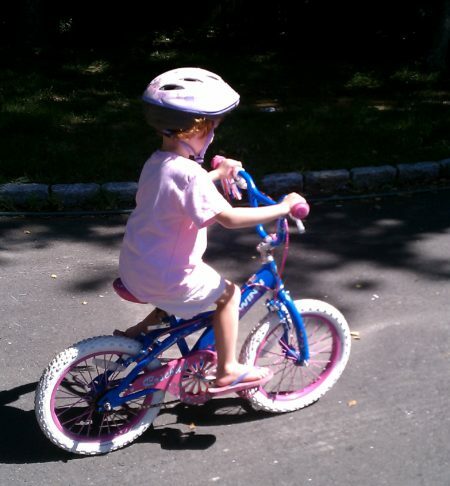 More than anything she wanted to ride that bike- without training wheels. Wobbling and balancing, wobbling and balancing- over and over and over and over- until, white knuckle fists grasped handlebars and streamers flying straight back, she flew down the driveway- by herself. She had done what she had set out to do. The speed, the wind and the freedom: hers for the taking. Over time his small bike has grown as he has. His bike is now parked in the garage, to big to hang beside hers. Somehow when the time is right, we will know what to do with hers- both the one she would have gotten for Christmas the year she died and the one that hangs in the garage. Until then, we will do as we have done- ever so slightly tilt our heads as we maneuver around the small pink and purple bike hanging from the ceiling. We will continue to ride within the chalked course lines we call life. We will know taking the training wheels off will always be scary, we will loose our balance and while the fall could be hard, when we let go and lean in, we will be amazed by the freedom we surely will encounter.